Therefore, we commend to all our members of the Convocation of Episcopal Churches in Europe to engage in dialogues for building relationships, the sharing of information, religious education, and celebration with people of other religions as part of our life together in Christ. 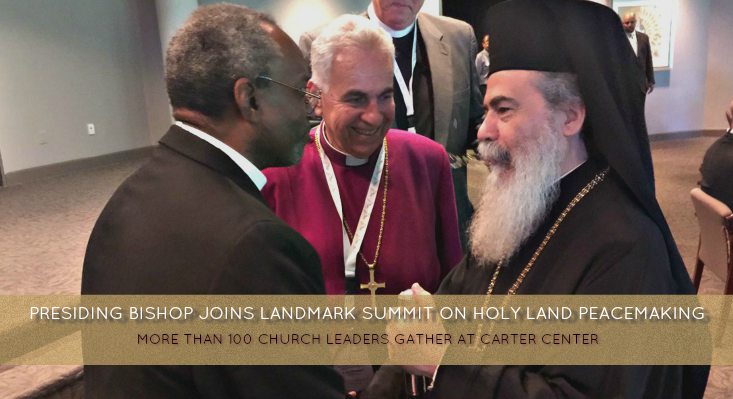 [Episcopal News Service] Archbishop Suheil Dawani of the Episcopal Diocese of Jerusalem (center) introduces Episcopal Church Presiding Bishop Michael Curry (left) to His Beatitude Theophilus III, Patriarch of Jerusalem and All Palestine (right), as the Rev. Robert Edmunds, the Episcopal Church’s Middle East partnership officer, looks on.